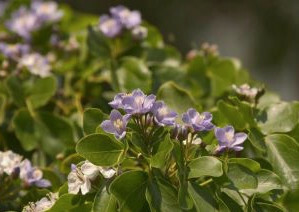 Known as Wayaká in Papiamentu, the Lignum Vitae trees are the only two species of evergreen native to Bonaire. The two species of Lignum Vitae that grow on the ABC Islands of the Dutch Caribbean are the Roughbark Lignum Vitae (Guaiacum officinale) and the Holywood Lignum Vitae (Guaiacum sanctum). These evergreen tree species are extremely slow growing and have multiple twisted trunks as well as leathery dark green leaves. Several times a year, they become covered in large clusters of beautiful small violet flowers that yield bright yellow-orange fruits. Lignum Vitae means “Tree of Life” in Latin, a name derived from the medicinal uses of this evergreen’s resin, which contains both blood-purifying and anti-inflammatory compounds. Historically, this evergreen was used to treat ailments from gout to syphilis. Today, it is used as a chronic arthritis treatment. It is the densest of all the trade woods, and historically was used to construct ship propeller shafts, mallets, police truncheons, and even to smooth the surface of gemstones; the wood is so dense and heavy that it actually sinks in water. The IUCN Red List categorizes both species as endangered due to historical overharvest of the timber. While the trees were harvested on a large scale on the ABC islands in the 18th and 19th centuries, they are now thrive on these islands and are a common sight, especially in protected areas such as the Washington Slagbaai National Park.